I can hardly believe that my 5 year wedding anniversary is this Friday!!! Wow...seems like just yesterday I was feeling the wedding jitters and getting ready to walk down the aisle. We had a storybook wedding and everything was perfect - I say that honestly. The weather was rainy the whole month prior to our wedding but our special day dawned cloudless, sunny and crisp. Talk about perfect!!!! If I could do it all over again, I would...with the same man! My husband is my closest earthly friend and I would not trade a day without him for anything. I have been wanting something personal to wear that has our photo on it and that would be a keepsake for my children, but not gaudy and clunky. Finding personalized jewelry was my goal and I am thrilled to say that I have found a spectacular company to help out in this area. Pictures On Gold is an online jewelry company that takes your photos and creates stunning pieces of jewelry that you can cherish forever. They carry everything from pendants to thumbprint jewelry to promise rings and the selection is awesome! At PicturesOnGold.com we used advanced engraving machinery to engrave your favorite photo pendants & picture charms. Your photo pendant and picture charm can be done in 14k gold or sterling silver. Our custom photo jewelry pendants and picture jewelry charms are available in solid 14 carat gold or sterling silver in a wide range of styles and designs. Picture bracelets, photo lockets, picture charms, picture pendants, watches, are just a few examples of the kinds of custom picture and photo jewelry we can create for you and your loved ones. No matter the occasion, making your memories last a lifetime with PicturesOnGold! Currently, I do not own any personalized jewelry...not because I don't like it, but because I have never treated myself to anything like that before. I think that personalized jewelry speaks volumes to others and really helps to keep those you love close to your heart and thoughts. This is a photo of my husband and I, of course. :) Like I said before, I wanted something special for our 5 year anniversary and this picture was taken last fall so it is farely recent. My pendant arrived just several days after I sent my photo to the company and I not only was I thrilled with the speedy delivery, I was thoroughly impressed with my locket. The first thing I noticed was how pretty the box was that the pendant came in...very attractive. And the locket was carefully packaged within the box so it would stay put during shipping and not slide all over the inside of the box. For my inscription, I chose to have "Forever My Love" engraved on the front...as that is how I view my husband. He is truly my one and only!!! Isn't is gorgeous??? I was unsure of what I would find once I opened the locket but was so happy with how it turned out when I finally opened it! The picture is surprisingly clear and in color too...which is a special touch that I love. As you can see, the photo was used perfectly and don't we look cute?!? :) I am also really excited to have this to pass on to my children...what a beautiful keepsake for them. 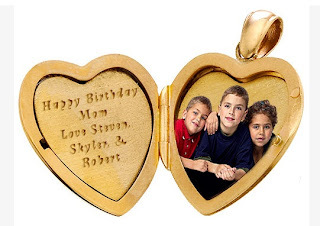 This particular locket is valued at $36.95 and that price does not include customization. So, in my opinion, Pictures On Gold is a fabulous company!! I am just in love with the locket I was sent and am thrilled with the quality and presentation of this fine piece of jewelry. Wow...absolutely stunning!!! The customer service is phenomenal and the delivery was very fast too...I was shocked at how fast I received my locket! I would definitely recommend this company to anyone looking for an authentic and lovely way to display their photos of loved ones...locket jewelry would make a lovely Christmas gift too!! Pictures On Gold has offered to give away a locket identical to the one I received!! This will be a Laser Silver Photo Locket, valued at over $200. The winner will have the option of engraving the front, inside and/or back and add 2 lasered photos. Winner will also receive a chain! Here are your entry options! Visit Pictures On Gold and then come back here and tell me a piece of their jewelry that you would love to own. :) You do not have to be a blogger to enter, but you must have a valid email where you can be reached should you win. If you do not leave an email address, it must be where I can easily find it. This giveaway is open to US residents and will end 11/18 at 11:59 pm EST. The winner will be chosen using random.org and will be notified by email. The winner will have 48 hours to respond, or another winner will be selected. 1. "Like" Pictures On Gold on Facebook. 2 entries, so 2 comments. 2. Follow Pictures On Gold on Twitter. 2 entries, so 2 comments. Disclaimer: I received no monetary compensation for this post. I did receive free Laser Silver Photo Locket for review purposes. All quotes and stock photos are from the Pictures On Gold website and email. Prize is being provided and shipped by the sponsor. All thoughts and opinions are 100% mine. I like the posh mommy birthstones disc. The locket would be a nice gift for MIL! 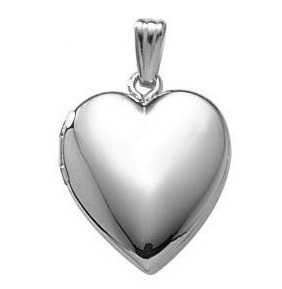 This Platinum Heart Premium Weight & Genuine Diamond Locket Jewelry piece is pretty! And realized just now that I didn't pop my email address into my first two comments: halfpinthouse at gmail dot com. I like the A Sister is a Forever Friend Locket. I follow Pictures on Gold on Twitter! Sterling Silver "Cascade of Hearts" Heart Key Locket is gorgeous. OMG - this company is great! I LOVE the Double heart fingerprint/footprint bracelet w/curb chain!!! ((1955nursehjc4me(at)myway(dot)com)) TY! I already follow you ((1955nursehjc4me(at)myway(dot)com)) via GFC! I would like the Sterling Silver Round Antique Locket Picture Locket Jewelry. I like the Posh Mommy™ Three Birthstones Disc. I really like the Pisces Necklace. i'd love a silver chain bracelet w/ small oval charm w/ my children's photos! The 14k White Gold Oval Mother of Pearl Cross Locket is also beautiful. The locket you received is great. Much better than trying to shrink down a photo for a regular locket. Thanks! I like the thumbprint on a circle locket. I would love the gorgeous Custom Print Butterfly Medal. I like Pictures on Gold on facebook as Susan Chester. 2.I like Pictures on Gold on facebook as Susan Chester. I like the rectangle picture pendants or the dog-tag styles. Thank you! I like PicturesOnGold on Facebook. I like PicturesOnGold on Facebook. #2 Entry. I like the Heart with Border Photo Pendant Picture Charm! I would love to have the 14K Yellow Gold "Always In My Heart" Locket with my mum's picture in it. These are beautiful! Liked Pictures on Gold's facebook. Followed Pictures on Gold's twitter. I love the sterling silver sweetheart I love you heart locket. Oh I love the Personalized Heart-Shaped Handprint / Footprint Medal -w/ Name & Date! Such a cute idea!